Featuring a tiered cake at a gathering is not only elegant, but practical, as well. Because of its vertical design, it allows you to provide more servings of cake in less space than a sheet cake. It also enables you to make your cake a decorative table centerpiece. And by making your own cake, you can save money and have a lot of fun at the same time. Create your own one-of-a-kind masterpiece by following a few simple steps. Bake your cake layers. Each tier will be a layer cake, so you will need two layers for each tier. 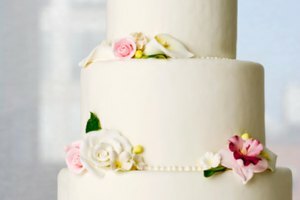 The bottom tier will need to be about 2 inches larger than the top tier, so you could bake two 8-inch layers and two 6-inch layers. Bake dense cakes that can hold the weight of the frosting or fondant and filling, if using. You can also switch things up a bit by making each tier a different flavor. Allow cake layers to cool. Place one layer of the bottom cake on a cake stand or cardboard cake round that is the same size as the cake. If using frosting in between layers, spread a thin layer of frosting. 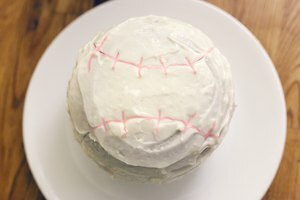 If using a filling, pipe a ring of frosting around the top edge of the bottom cake layer to act as a dam to prevent your filling from squeezing out to the edge of the cake. Spread the filling. Place the other layer on top. Frost the bottom tier as usual, or if you are using fondant, cover the tier with fondant. Chill before assembling. Repeat Steps 2 and 3 for the top cake tier, placing the cake on a cardboard cake round that is the same size as the smaller cake. Mark where the top tier will go. Place the smaller cake pan you used to bake the top layer upside down on top of the bottom tier cake, and very gently push the pan into the frosting or fondant to mark where the top layer will go. Remove cake pan. Take wooden cake dowels that you can purchase from most craft or kitchen stores, and insert one in the bottom tier within the marked area to mark the depth of cake. Cut four to five dowels so they are the same height as the cake. Insert dowels into the bottom layer of cake inside the marked area. The dowels should be about a half inch from the edge of the marked area, with one dowel in the center for extra support, if desired. 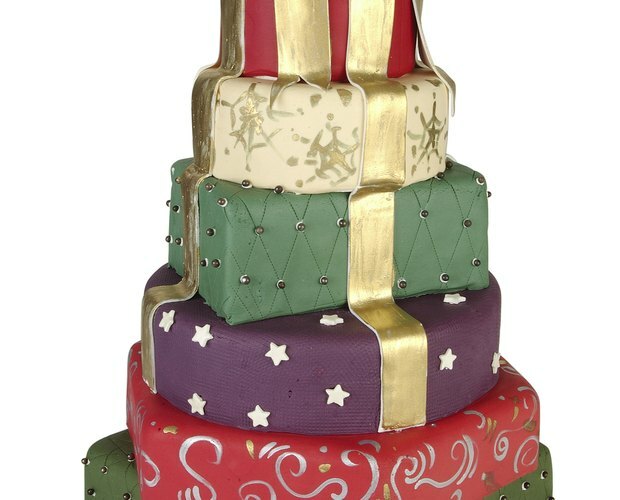 Add the top tier cake to the marked bottom layer area, and you are now ready to decorate!